Cestujete so svojím psom alebo iným domácim zvieracím miláčikom? Tu je ponuka ubytovania v Trpejca, kde Vám umožní vziať si svojho domáceho maznáčika (pes, mačka či iné menšie zviera) so sebou. Dosť často si hotely účtujú menší poplatok, mnohokrát závisí od veľkosti a počtu psov či iných zvierat. Uveďte podrobnosti o svojom miláčikovi do poznámky rezervácie. Within the Galichica National Park, Elite House Trpejca is located a 2-minute walk from Lake Ohrid and offers units with views of the lake or Mount Galichitsa. WiFi is free and there is an à la carte restaurant. 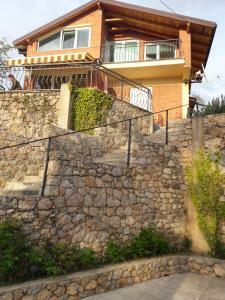 Bonaca is a property located in Trpejca near Saint Nicholas Church. Offering free WiFi, the property also has a private beach area and a garden. Situated next to the lake, Kostoski Villa offers accommodation in Trpejca village, 15 kilometers away from Ohrd. The famous monastery of Sent Naum is 10 kilometers from the property and the Wave of Bones museum is 3 km away. Barbecue facilities and a garden are offered at Vila Popovski, which is situated in Ljubaništa, 2.8 km away from Ohrid Lake Springs and 2. 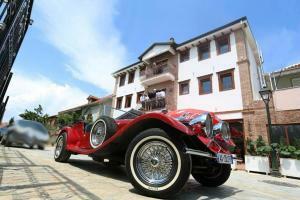 Featuring a private beach area and a restaurant, Hotel Desaret is set in Ohrid. With a seasonal outdoor swimming pool, the property also has a garden. Offering free WiFi and lake views, oliver is an accommodation set in Peštani. This country house features a garden and barbecue facilities. Set in Peštani, 3.9 km from Bay of Bones, BATO Rooms has a garden, as well as free WiFi. Featuring barbecue facilities, a garden, and a terrace, Apartment Forest and Lake features accommodation in Lagadin with free WiFi and mountain views. The property features lake views. Karali Apartments are located 550 metres from the Ohrid Lake and 9km from Ohrid city center. The property is surrounded by a lush garden. Set in Ohrid, 10 km from Port Ohrid, Villa Two Brothers provides a restaurant and mountain views. Complimentary WiFi is featured. Located 10 km from Port Ohrid, Villa Lagadin provides barbecue facilities, a garden and free WiFi. The apartment offers a terrace.